Introduction: Early detection of breast cancer plays a pivotal role in the outcome of the disease. Diagnostic modalities encompass radiological and pathological findings. The aim of this study is to evaluate the correlation between the results of these two modalities in a tertiary hospital. Materials and Methods: From a total of 180 patients, 203 ultrasound-guided breast core needle biopsies (US-CNBs) were included in this study over a period of a year (May 2015 - May 2016). All clinical parameters, the site of the biopsy, the size of the needle, the radiological findings, the pathological diagnoses as well as all available follow-up data were reviewed. The concordance between the radiological and pathological results was studied and a statistical analysis conforms to the Pearson Chi-square test was applied. Results: The majority of our patients were above 40 years of age. A strong and statistically significant association was noted between radiological findings and histopathological results (Pearson's Chi-square test = 186.28, P ≤ 0.0001) with only four discordant cases (1.97%). This discrepancy was not statistically associated with age, site of biopsy, needle size, or number of cores obtained (P = 0.621, P = 0.584, P = 0.786, and P = 0.478, respectively). Conclusions: US-CNB is an accurate method in the diagnosis of breast lesions. Radiological and pathological correlation is of utmost importance in relation to patient's care and to reduce false rates. Follow-up of concordant benign lesions is essential. In addition, the importance of a multidisciplinary breast conference during which input from all teams caring for the patient is strongly emphasized. Breast cancer comprised 25.8% of all newly diagnosed female cancers in Saudi Arabia in 2012, thus ranking as the most common malignancy among females with tremendous socioeconomic, emotional, and public health implications. Radiological-pathological discordance of stereotactic or ultrasound (US)-guided biopsies has been reported to range from 1% to 8% and is slightly greater for magnetic resonance imaging-guided biopsies., The objectives of this study were to evaluate the correlation between radiological and pathological findings in US-guided breast core needle biopsies (US-CNBs) in a teaching hospital and to discuss practices that may be associated with greater correlation rates. From May 1, 2015 to May 1, 2016, a total of 235 US-CNBs were performed in 210 consented female patients in King Khalid University Hospital, Riyadh. After retrospectively reviewing the medical records and the histopathological results of these biopsies, 32 biopsies from thirty patients – for which the sample was nondiagnostic or the patient's radiological reports or films were unavailable – were excluded from this study. Clinical and demographic data were collected from electronic medical records. Women 40 years or older had a mammogram and a baseline US. Women under 40 years of age had only breast US. Mammography was performed in two standard imaging planes (mediolateral oblique and craniocaudal). Additional projections were performed as needed. Radiological findings including mass, calcifications, architectural distortion, or asymmetric density were recorded and assigned a breast imaging reporting and data system (BI-RADS) category by at least two radiologists (a senior registrar and an attending radiologist). A consensus was reached by two attending radiologists in controversial cases. For women <40 years of age, a BI-RADS category is determined by the breast US findings. For women ≥40 years of age, our radiologists simultaneously interpret the findings of both mammography and the subsequent breast US. The same BI-RADS category is given for both modalities, except when the mammogram is incomplete (BI-RADS 0), for which the final BI-RADS category is determined by the US findings. Percutaneous US-CNBs were performed at the request of patients or referring physicians. The choice of the needle gauge used in the procedure was determined by the radiologist's preference and experience. Three to four core samples were obtained in most lesions. All core specimens were placed in 10% neutral buffered formalin and sent for pathologic analysis. US-CNBs are processed in a routine manner to paraffin embedding. The protocol for sectioning includes a single level for core biopsies from mass lesions and a minimum of three levels for these taken for the investigation of microcalcifications. For each patient, two histopathological results were reviewed: the results of the US-CNB and the results of the subsequent surgical excision, when available. The radiological and pathological findings of the US-CNB are considered to be concordant when the pathological results provide an acceptable explanation for the imaging features and discordant when they do not. The Pearson Chi-square test (at a degree of freedom equals to 1) was calculated to measure the association between imaging findings and histopathological results. Other parameters were calculated using the SPSS version 23 software (SPSS Inc., IBM, Chicago, IL, USA) and a P < 0.05 was considered statistically significant. The mean age in this study was 42.3 years (age range 14–81 years). One hundred and one women were aged 40 years and above (61.66%), the remaining were younger than 40 (38.34%). At the time of the initial diagnostic examination, 151 women were symptomatic. Of the symptomatic women, 118 (65.55%) complained of a palpable mass followed by 21 (16.11%) who had pain. Twenty-nine women (16.11%) – all above the age of 40 – were asymptomatic and presented only for their annual screening mammography. Sixty-five women (36.11%) had associated risk factors or other medical/surgical conditions. 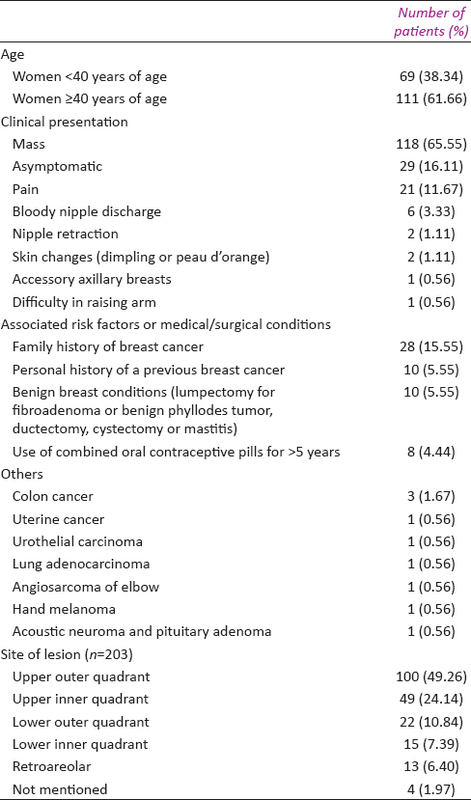 A family history of breast cancer was the most common risk factor, occurring in 28 patients (15.55%), followed by a previous personal history of breast malignancy in 10 patients (5.55%). 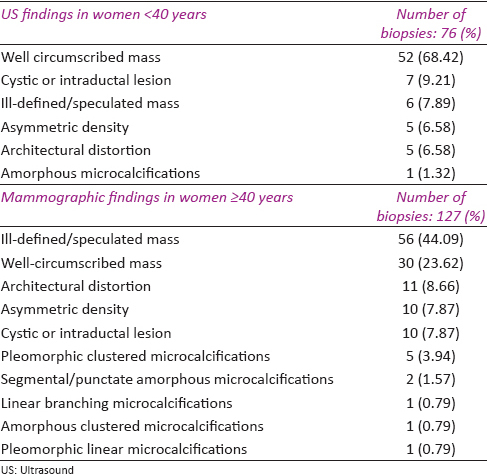 A well-circumscribed hypoechoic mass (52, 68.42%) and an ill-defined/speculated mass (56, 44.09%) were the most common abnormalities among sonographic and mammographic findings, respectively. Amorphous microcalcifications were detected in 1 US test (1.32%). A total of 10 cases had mammographically detected microcalcifications: pleomorphic clustered in 5 cases (3.94%), segmental/punctate and amorphous in 2 cases (1.57%), linear branching in 1 case (0.79%), amorphous clustered in 1 case (0.79%), and pleomorphic linear in 1 case (0.79%). Twenty-two women (12.22%) had more than one lesion that resulted in a total of 203 percutaneous US-CNBs (11 had bilateral lesions, 10 had multicentric lesions, and 1 patient had 2 biopsies from the left breast and 1 from the right). Most lesions were found in the upper outer quadrant (100, 49.26%) and the left breast was affected more than the right in 108 lesions (53.20%). The clinical and radiological characteristics were summarized in [Table 1] and [Table 2], respectively. Sixty-four lesions (31.53%) were assigned BI-RADS 5 category. The second most common category was BI-RADS 3 in 56 lesions (27.59%). Radiologists used large core needles 14- and 16-gauge in 55.67% and 27.09% of the biopsies, respectively. 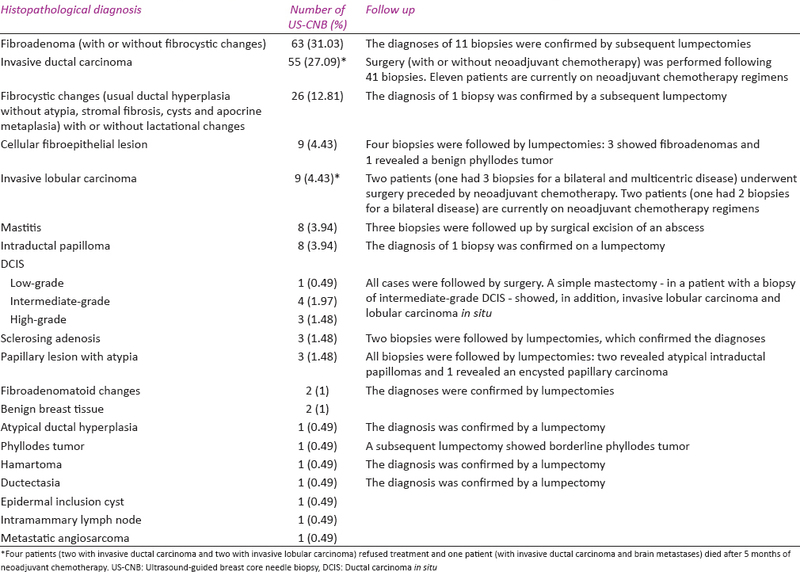 [Table 3] shows the number of cases in each BI-RADS category and the needle size used to obtain the biopsies. BI-RADS 2 and 3 lesions, comprising 39.41% of all radiologically detected abnormalities, were biopsied upon the request of the patient or physician. The number of core samples taken was specified in the histology report and ranged from 1 to 7 cores (mean 3.84, median 4). Of the 203 lesions, 73 (35.96%) were malignant. There were 55 cases of invasive ductal carcinoma (IDC), not otherwise specified, 9 cases of invasive lobular carcinoma (ILC): 6 classic type and 3 pleomorphic type; 8 cases of ductal carcinoma in situ: 1 - low nuclear grade, 4 - intermediate nuclear grade, 3 - high nuclear grade; and 1 case of metastatic angiosarcoma. BI-RADS categories 4c, 5, and 6 were assigned to the invasive tumors as follows: 4 biopsies of IDC were BI-RADS 4c; 51 biopsies of IDC, 8 biopsies of ILC and the case of metastatic angiosarcoma were BI-RADS 5 and a case of ILC was assigned a BI-RADS category 6. Surgery (with or without neoadjuvant chemotherapy) was performed following 41 biopsies of IDC and 4 biopsies of ILC. Thirteen patients (11 with IDC and 2 with ILC) are currently on neoadjuvant chemotherapy. A total of 4 patients (2 with IDC and 2 with ILC) refused therapy and 1 patient with IDC and distant metastasis died after 5 months of neoadjuvant chemotherapy. Radiological abnormalities assigned BI-RADS 5 and 4c have preceded the diagnosis of 4 and 2 cases of DCIS, respectively. Two DCIS biopsies (1 intermediate-nuclear grade and 1 high-nuclear grade) were assigned a BI-RADS 3 category and thus were considered discordant. All DCIS biopsies were followed by surgery (lumpectomy or mastectomy) upon which the diagnoses were confirmed and upstaged in a single case that revealed ILC and LCIS, classic types, in addition to intermediate nuclear grade DCIS. Atypical lesions included 1 atypical ductal hyperplasia (ADH), 3 papillary lesions with atypia, and a case of phyllodes tumor, all of which were followed by total excision. The diagnosis of ADH and two of the atypical papillary lesions were preceded by BI-RADS category 4a radiological abnormalities. Surgery confirmed the diagnosis of ADH. The two atypical papillary lesions were atypical intraductal papillomas. The remaining atypical papillary lesion was assigned a BI-RADS 4c category and found to be an encysted papillary carcinoma following excision. BI-RADS category 4b preceded the biopsy of a phyllodes tumor. Follow-up surgery showed a borderline phyllodes tumor. In the remaining 125 lesions, the diagnoses were benign and the most common of these were fibroadenoma (63, 31.03%), fibrocystic changes (26, 12.81%), and cellular fibroepithelial lesions (9, 4.43%). BI-RADS categories 2, 3, and 4a were assigned to 9, 36, and 17 fibroadenomas, respectively. A radiologically circumscribed hypoechoic solid mass, measuring 2 cm on US with microcalcifications seen on mammogram, was assigned a BI-RADS category 4 with no subcategorization. This lesion, in a 47-year-old female with a positive family history of breast cancer, was biopsied using 14-gauge needle and 4 cores were obtained. The initial and revised pathological diagnosis was a fibroadenoma with no microcalcifications even on deeper levels. No block X-ray was performed. Due to the absence of microcalcifications, the wide risk range of BI-RADS category 4 (>2%–<95%) and the fact that the biopsy was not followed by surgery, this case was considered discordant. BI-RADS categories 2, 3, and 4a were assigned to 5, 17, and 7 cases of fibrocystic changes (including usual ductal hyperplasia without atypia, stromal fibrosis, cysts, and apocrine metaplasia), respectively. A 31-year-old lactating woman presented with skin dimpling during lactation and provided a history of a medically treated mastitis. The patient underwent an US examination, which revealed what was described as a deeply located highly suspicious hypoechoic speculated mass with associated architectural distortion, measuring 1 cm in greatest dimension. Using a 14 - gauge needle, three cores were obtained from the lesion and it was assigned a BI-RADS category 5. The initial and revised pathological diagnosis was fibrocystic and lactational changes. Due to the radiological and pathological discrepancy, a wire localization lumpectomy was performed and revealed fibrocystic and focal lactational changes only. The patient's latest US (1 year after the lumpectomy) showed a surgical scar (BI-RADS 2). This case was also considered discordant. [Table 4] summarizes the histopathological diagnoses and available follow-up. A total of 4 cases, representing 1.97% (P = 0.734) of all biopsies, showed radiological-pathological discordance. This discrepancy was not statistically associated with age, site of biopsy, needle size, or number of cores obtained (P = 0.621, P = 0.584, P = 0.786, and P = 0.478, respectively). The Pearson's Chi-square test was equal to 186.28 (P ≤ 0.0001) and Cramer's V = 0.9579, which indicated a strong and statistically significant association between radiological findings and histopathological results. Eighty-four biopsies were followed by surgery (lumpectomy or mastectomy). The diagnosis was upstaged in 2 cases representing 2.38% of all surgeries (P = 0.517): A mastectomy, following a diagnosis of intermediate nuclear grade DCIS, showed ILC and LCIS; and a lumpectomy, following a diagnosis of atypical papillary lesion, showed an encysted papillary carcinoma. Due to the lack of long-term follow-up, only benign biopsies followed by surgery were considered true negative. The overall sensitivity and specificity of US in women <40 years for the detection of breast malignancy were 91.66% and 92.86%, respectively. The overall sensitivity and specificity of mammography accompanied by a baseline US in women ≥40 years for the detection of breast malignancy were 98.33% and 100%, respectively. Since Parker et al. first described the use of sonographically guided 14-gauge core biopsy for the assessment of breast lesions in 1993; percutaneous imaging-guided CNB has largely replaced excisional biopsies to assess suspicious breast lesions. In our breast clinics, US-CNB is the most common diagnostic interventional procedure. However, false negative diagnoses are unavoidable. In US-guided 14-gauge CNBs, the false negative rates range from 0% to 3.6% (mean, 1.8%) in studies without a long-term follow-up and from 1.2% to 3.3% (mean 2%) in studies with follow-up at 2 years.,, To reduce false negative rates and thus avoid delayed diagnoses and treatment, a radiological-pathological correlation is of critical importance in evaluating US-CNB. Most false negative diagnoses were detected by imaging-histological discordance., In our series, a total of 4 cases showed radiological-pathological discordance. Two out of these 4 patients showed discordant malignant results on US-CNB and a patient showed a discordant benign result. All three patients underwent surgery that confirmed the diagnoses rendered on the US-CNB within 3–8 months duration. The fourth patient was assigned a BI-RADS 4 category for a circumscribed lesion with microcalcifications. US-CNB showed a fibroadenoma; however, microcalcifications were not seen, the case has not been discussed in a tumor board and the patient did not undergo neither a rebiopsy nor a subsequent surgery; thus, the results were considered discordant. Technical or sampling errors are among the reasons for a radiological-pathological discordance. Several studies have shown that a minimum of 4–5 cores is required to obtain a definitive diagnosis., Other studies pointed to the potential variability associated with the differences in needle gauges., Nath et al. conducted a study on biopsies of surgically removed specimens with three different gauges (14, 16, and 18) of core needles. The authors concluded that biopsy samples obtained with a 14-gauge needle compared with a 16- or 18-gauge needle provide the most accurate diagnosis, which correlates with the diagnosis made upon surgical excision. However, this study was limited by the fact that the CNB was not performed under US guidance, and only one core of specimen was obtained and compared. Lai et al. showed that compared with the 16-, the 14-gauge needle has higher sensitivity (94.5% vs. 91.9%) and specificity (100% vs. 99.1%); however, the differences were not statistically significant (P values were 0.17 and 0.38, separately). On the other hand, they found that a higher false negative rate (6.5% vs. 3.4%) and underestimation rate (8.8% vs. 2.6%) are seen with the 16-gauge needle and concluded that a 14-gauge core needle is more accurate than the 16 (96.6% vs. 93.3%, P = 0.02). Three of our 4 discordant cases were obtained using a 14-gauge core needle; an 18-gauge core needle was used in the fourth case. Three to four tissue cores were obtained in all 4 cases. We also noted that the vast majority of our benign lesions were assigned categories 3 and 4a (54:43.2% and 47:37.6%, respectively). Some legitimate reasons for performing a biopsy on BI-RADS 3 lesions are the presence of malignant tumors in the same breast or the opposite breast, demands from apprehensive patients, and uncertainty as to whether the patient will comply with the required regular mammographic follow-up examinations. Our institutional policy regarding all BI-RADS 3 lesions with concordant benign breast lesions is a 6-month imaging follow-up. The malignancy rate of benign concordant lesions during follow-up is <1%; thus, follow-up is recommended.,,, However, there are no standard follow-up guidelines for concordant benign lesions. The 2010 and 2013 consensus guidelines published by the National Comprehensive Cancer Network recommend follow-up diagnostic imaging and physical examination every 6–12 months for 1–2 years following a concordant benign CNB, before releasing these women back into the general screening population. However, several recent studies have suggested that a short-term follow-up for benign concordant lesions does not improve breast cancer detection., Adams et al. detected no malignancies in 6- or 12-month follow-up examinations while five malignancies (2.4% of 207) were found at 24-month follow-up, all of which occurred in women over the age of 40. In addition, a 6-month follow-up after a benign breast biopsy increases health-care costs. Manjoros et al. reported a cost of $41,813.77 to detect 1 missed cancer within 12 months after a benign concordant CNB. The small number of patients in this series and the lack of long-term follow-up for benign concordant US-CNB limit our study. Thus, larger studies with prolonged follow-up periods are warranted to enable the revision of our institution's follow-up guidelines. In addition, although a comprehensive knowledge of imaging is not a prerequisite for pathologists reporting US-CNB, it helps in the interpretation of the pathological findings. This knowledge is gained largely through regular meetings, at which the pathology and imaging results for specific patients are presented, and outcomes and further management are discussed in a multidisciplinary setting. Dillon et al. reported that a triple assessment of the clinical, radiological, and pathological findings provided prompt recognition of 77 of 85 discordant results. Thus, though some practices might be expected to increase radiological-pathological correlation rates, for example, separating cores with calcifications, reviewing radiological reports or images before signing out cases, and having a designated breast pathologist, none of these practices were significantly associated with greater correlation rates as reported by the American College of Pathologists. The only practice that was significantly associated with a greater correlation rate was having a breast biopsy multidisciplinary conference. Since we do not have a formal system in place to ensure radiological-pathological correlation in our department, we strongly recommend establishing specialty-based multidisciplinary breast cancer meetings with our fellow clinicians and radiologists to reduce discordance rates and plan appropriate management and follow-up. We would like to express our gratitude to the Medical Research Center at King Khalid University Hospital and the Deanship of Research at King Saud University for their support and encouragement during the preparation of this manuscript. Cancer Incidence Reports. Saudi Cancer Registry; 1994-2012. Available from: http://www.chs.gov.sa/Ar/HealthRecords/CancerRegistry/Pages/CancerRegistryRecords.aspx. [Last updated on 2013 Dec 01; Last accessed on 2016 Oct 11]. Lee JM, Kaplan JB, Murray MP, Bartella L, Morris EA, Joo S, et al. Imaging histologic discordance at MRI-guided 9-gauge vacuum-assisted breast biopsy. AJR Am J Roentgenol 2007;189:852-9. Philpotts LE, Hooley RJ, Lee CH. Comparison of automated versus vacuum-assisted biopsy methods for sonographically guided core biopsy of the breast. AJR Am J Roentgenol 2003;180:347-51. Ibrahim EM, Zeeneldin AA, Sadiq BB, Ezzat AA. The present and the future of breast cancer burden in the Kingdom of Saudi Arabia. Med Oncol 2008;25:387-93. Kemp Jacobsen K, O'Meara ES, Key D, Buist SM, Kerlikowske K, Vejborg I, et al. Comparing sensitivity and specificity of screening mammography in the United States and Denmark. Int J Cancer 2015;137:2198-207. Ohuchi N, Suzuki A, Sobue T, Kawai M, Yamamoto S, Zheng YF, et al. Sensitivity and specificity of mammography and adjunctive ultrasonography to screen for breast cancer in the Japan Strategic Anti-cancer Randomized Trial (J-START): A randomised controlled trial. Lancet 2016;387:341-8. Parker SH, Jobe WE, Dennis MA, Stavros AT, Johnson KK, Yakes WF, et al. US-guided automated large-core breast biopsy. Radiology 1993;187:507-11. Fajardo LL, Pisano ED, Caudry DJ, Gatsonis CA, Berg WA, Connolly J, et al. Stereotactic and sonographic large-core biopsy of nonpalpable breast lesions: Results of the Radiologic Diagnostic Oncology Group V study. Acad Radiol 2004;11:293-308. Shah VI, Raju U, Chitale D, Deshpande V, Gregory N, Strand V. False-negative core needle biopsies of the breast: An analysis of clinical, radiologic, and pathologic findings in 27 concecutive cases of missed breast cancer. Cancer 2003;97:1824-31. Sauer G, Deissler H, Strunz K, Helms G, Remmel E, Koretz K, et al. Ultrasound-guided large-core needle biopsies of breast lesions: Analysis of 962 cases to determine the number of samples for reliable tumour classification. Br J Cancer 2005;92:231-5. Liberman L, Feng TL, Dershaw DD, Morris EA, Abramson AF. US-guided core breast biopsy: Use and cost-effectiveness. Radiology 1998;208:717-23. Crystal P, Koretz M, Shcharynsky S, Makarov V, Strano S. Accuracy of sonographically guided 14-gauge core-needle biopsy: Results of 715 consecutive breast biopsies with at least two-year follow-up of benign lesions. J Clin Ultrasound 2005;33:47-52. Youk JH, Kim EK, Kim MJ, Lee JY, Oh KK. Missed breast cancers at US-guided core needle biopsy: How to reduce them. Radiographics 2007;27:79-94. Schueller G, Jaromi S, Ponhold L, Fuchsjaeger M, Memarsadeghi M, Rudas M, et al. US-guided 14-gauge core-needle breast biopsy: Results of a validation study in 1352 cases. Radiology 2008;248:406-13. Nath ME, Robinson TM, Tobon H, Chough DM, Sumkin JH. 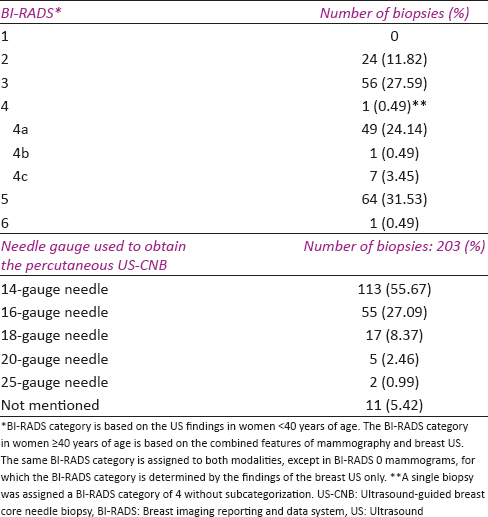 Automated large-core needle biopsy of surgically removed breast lesions: Comparison of samples obtained with 14-, 16-, and 18-gauge needles. Radiology 1995;197:739-42. Lai HW, Wu HK, Kuo SJ, Chen ST, Tseng HS, Tseng LM, et al. Differences in accuracy and underestimation rates for 14-versus 16-gauge core needle biopsies in ultrasound-detectable breast lesions. Asian J Surg 2013;36:83-8. Mendez A, Cabanillas F, Echenique M, Malekshamran K, Perez I, Ramos E. Evaluation of breast imaging reporting and data system category 3 mammograms and the use of stereotactic vacuum-assisted breast biopsy in a nonacademic community practice. Cancer 2004;100:710-4. Salkowski LR, Fowler AM, Burnside ES, Sisney GA. Utility of 6-month follow-up imaging after a concordant benign breast biopsy result. Radiology 2011;258:380-7. Youk JH, Jung I, Kim EK, Kim MJ, Son EJ, Moon HJ, et al. US follow-up protocol in concordant benign result after US-guided 14-gauge core needle breast biopsy. Breast Cancer Res Treat 2012;132:1089-97. Guidelines for Breast Cancer Screening and Diagnosis. NCCN Guidelines Version 2.2013. National Comprehensive Cancer Network; 2013. Available from: http://www.nccn.org. [Last updated on 2013 Jul 27; Last accessed on 2016 Oct 11]. Adams MC, Falcon S, Mooney BP, Laronga C, Chau A, Drukteinis JS. Short-term imaging follow-up of patients with concordant benign breast core needle biopsies: Is it really worth it? Diagn Interv Radiol 2014;20:464-9. Manjoros DT, Collett AE, Alberty-Oller JJ, Frazier TG, Barrio AV. The value of 6-month interval imaging after benign radiologic-pathologic concordant minimally invasive breast biopsy. Ann Surg Oncol 2013;20:3163-8. Dillon MF, Hill AD, Quinn CM, O'Doherty A, McDermott EW, O'Higgins N. The accuracy of ultrasound, stereotactic, and clinical core biopsies in the diagnosis of breast cancer, with an analysis of false-negative cases. Ann Surg 2005;242:701-7. Idowu MO, Hardy LB, Souers RJ, Nakhleh RE. Pathologic diagnostic correlation with breast imaging findings: A College of American Pathologists Q-Probes study of 48 institutions. Arch Pathol Lab Med 2012;136:53-60.